I love to read and quite frankly the only reason I really started this blog was to talk about reading and books. But for the last six months, while I'm reading as prolifically as always, I just haven't read anything that I thought worthy of public discussion here. I don't know if books, like films, etc. are not being published in as many numbers and therefore the quality is down or what (I do know that I don't often find a DVD to rent because there doesn't seem to be as many movies that interest me these days). Until I read HOTEL BEMELMANS by Ludwig Bemelmans. He was a New York busboy, waiter, and restaurateur in New York in the 20's and 30's. The book is a series of short essays or sketches about the life and times of the Hotel Splendide where Bemelmans worked. The Splendide was in reality the Ritz Carlton. With an introduction by Anthony Bourdain (Kitchen Confidential), the book tells the secrets and scandals of the hotel's staff and rich patrons and guests. As Bemelman's modern day counterpart, Bourdain says: "Ludwig Bemelmans was the original bad boy of the New York hotel/restaurant subculture." 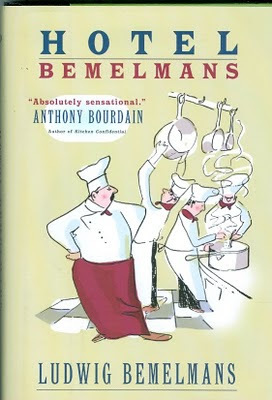 Bemelmans has several claims to fame besides his bad boy restaurateur image. 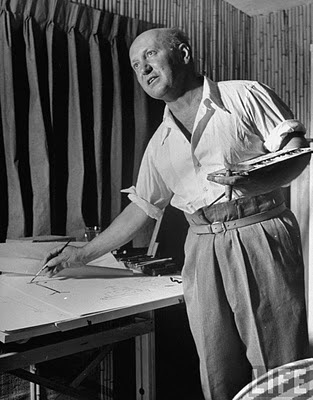 He was an artist and humorist and perhaps most famous for being the author and illustrator of the Madeline books. Like the Madeline series, HOTEL BEMELMANS includes the au thor's illustrations of the various characters and episodes that are in the book. Originally from Austria, Bemelmans arrived here as the book says: "at the age of sixteen after he shot a head-waiter at his uncle's hotel." He has a very wry and wickedly funny sense of humor and I literally guffawed throughout the book. 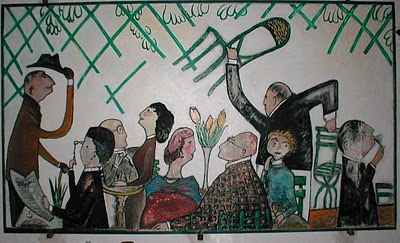 "Otto Brauhaus (illustration by Bemelmans at right) was an immense stout man; he had to bend down to pass under the tall doorways of his hotel. Big as his feet, which gave him much trouble, telegraphing their sorrows to his ever-worried face, was his heart. For despite his conception of himself as a stern executive, and strict disciplinarian, he could not conceal his kindness. He liked to laugh with guests and employees alike, and the result was that his countenance was the scene of an unending emotional conflict." When he discovers the staff having fun when they thought he was away "Brauhaus stormed back there and exploded: 'What is diss? Gotdemm it! Cheeses Greisd! You have a birdtay zelepration here?'" There are certain phrases in books that somehow make their way into my daily lexicon. "Fecking eejit" is one (from Frank McCourt's Angela's Ashes, one of my favorite books of all time). But "Gotdemm it Cheeses Greisd" is the newest. His drawings are as unique as his writing voice as well. Each person illustrated in the drawing reflects a certain self-assuredness/self-possession with themselves. While this is funny when you encounter a pompous, it's even funnier depicting the eccentricities of some of the characters. This book is really just delightful. You'll relish every moment. I swear, Gotdemm it Cheeses Greisd! 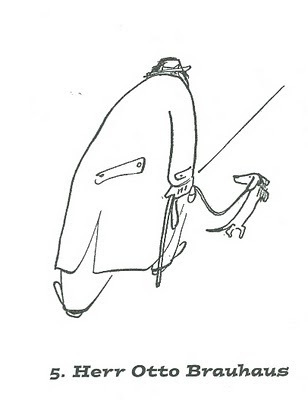 Bemelmans' stories are an absolute delight! All the latest hospitality-related TV reality shows about what goes on behind the curtain at the hotels, bars, restaurants are only now scratching the surface, while Ludwig has already been there, done that 75 years ago.